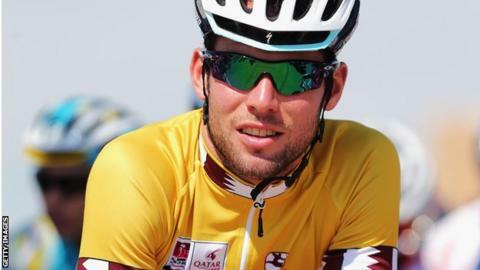 Mark Cavendish sprinted to his fourth successive stage win at the Tour of Qatar to wrap up overall victory. The Manxman took the 116km final stage ahead of Belarus' Yauheni Hutarovich and Barry Markus of the Netherlands. Omega Pharma-QuickStep rider Cavendish, 27, overcame a crash after just 15km as the peloton waited for him to catch up. "Amazing to have a race full of real gentlemen today, who neutralised a close race so I could rejoin the group after crashing," tweeted Cavendish. The win is Cavendish's second general classification triumph, after winning the Ster ZLM Toer in the Netherlands last year. He finished ahead of BMC Racing's American duo Brent Bookwalter and Taylor Phinney in the final standings. Fellow Briton Adam Blyth, also a BMC rider, finished fourth overall. Team Sky duo Luke Rowe and Geraint Thomas ended the week-long race in ninth and 10th - 40 seconds adrift of Cavendish - to ensure four British riders finished in the top 10. On the last stage from Sealine Beach to Doha, Cavendish and Bookwalter crashed early on but neither were hurt and the Isle of Man rider claimed victory following a bunch sprint. Cavendish's team-mate Tom Boonen, who was unable to take part this year due to an injured elbow, has won the race four times (2012, 2009, 2008 and 2006). "We come here every year almost guaranteed an overall victory with Tom Boonen, but he's recovering from an injury," said Cavendish. "It put a little bit of pressure on me and I was a bit nervous. "But I'm really happy to get the win. The guys worked incredibly here, they really looked after me so, so well here and delivered every single day." Cavendish parted company with Team Sky to join the Belgium-based outfit in October 2012. The winner of 23 Tour de France stages, won his first competitive race for Omega Pharma-QuickStep on the opening stage of the Tour of San Luis in Argentina in January.